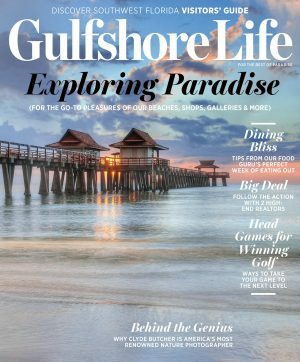 Since 1970, Gulfshore Life magazine has captured the vibrant spirit, style and natural beauty of Southwest Florida’s Gulf Coast, from Fort Myers and Cape Coral down to Naples and Marco Island. The region has grown in recent years to become an international hotspot that attracts sophisticated, cosmopolitan residents and visitors from all over the globe. Our coverage of local personalities and pursuits, from arts and entertainment to fashion, real estate and the luxury lifestyle, helps these residents and visitors enjoy the best of the region. The magazine has earned numerous state and national awards for writing, design and publishing excellence—including recognition as Best Overall Magazine from the Florida Magazine Association. charitable, cultural and business organizations in a variety of ways. From its Naples offices, Gulfshore Life LLC also publishes Gulfshore Life, Gulfshore Life At Home, Healthy Life, Health Source, Discover Southwest Florida Visitors’ Annual, the Naples Chamber of Commerce’s Naples on the Gulf visitors guide and Downtown Naples; NCH Healthcare System’s Naples Health; Naples Area Board of Realtors , NABOR and numerous other publications.